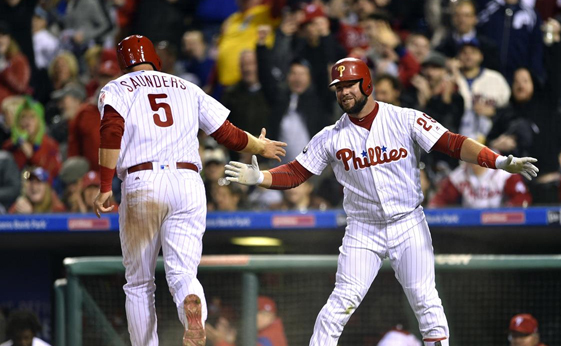 The Phillies offense made history last night, scoring 12 runs in the first inning to establish a new franchise record. The mark also tied for the second most runs scored in an inning in franchise history. Aaron Nola was the beneficiary, surrendering just three runs over six innings in his first major league start since last July as the Phillies trounced the Nationals, 17-3. "You never know when these innings are going to happen again," Phillies first baseman Tommy Joseph said. "As they keep piling you try to get as many as you can." Joseph ended the contest with a pair of hits while Howie Kendrick and Michael Saunders collected three each; Saunders fell a homer short of completing a cycle. "I take responsibility for today," joked Saunders, who shaved his beard pregame after starting the season with just one hit in his first 10 at-bats. As for Nola, he scattered seven hits, two walks and struck out seven. He threw 89 pitches. "Felt like just another start," Nola said. "I'm healthy. I know a lot of people are wondering, or have been wondering or are still wondering, but I'm healthy. And I feel great. I just want to stay healthy and maintain that for the remainder of the year." Hellickson tossed five innings and recorded the win on Opening Day, surrendering six hits and a run against the Reds. He's struggled against Washington though throughout his career, going just 1-3 with a 5.67 ERA over six career starts.